Airpack are complete installation mounted on a skid, which are fully automatic, completely cabled and interconnected. 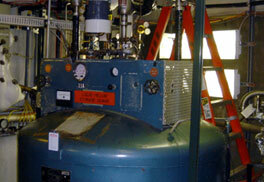 We make air compressor packages, gas compressor packages and nitrogen generator packages. Air and Gas Compressor package exist of a complete skid mounted lubricated compressor (s) different types as mentioned underneath. Furthermore electrical motors, diesel engines, turbines, pressure vessels, separators and sequence panels can be mounted Accessories like oil- and air coolers (forced by cooled air or water-cooled), oil - and water pumps, oil - and air filters (duplex or single) in all possible constructions, level switches, all kinds of valves and controls and safeties etc. can be offered. 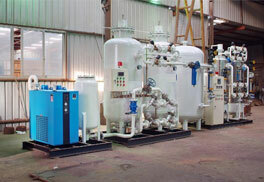 Nitrogen generators according to the membrane separation principle with a nitrogen purity upto 98%. Membrane units exist of compressed air filters, pressure control valves, hand valves , pressure indicators, membrane modules, oxygen analyzers, calibration units and vessels. Nitrogen generators according to the pressure swing adsorption (PSA) principle, with a nitrogen purity upto 99.99%. PSA systems exist of compressed air filters, solenoid actuated valves, separation and mixing vessels, pressure control valves, back pressure valves, hand valves, pressure indicators and flow indicators AIR AND GAS DRYER PACKAGES The air and gas dryer can be added to the air and gas compressor package or can be supplied as a completely mounted single package. Several kinds of dryers can be offered, with a by customer pre determined quantity and quality (dew point) of air /gas. Dew-points upto -80°C under pressure can be obtained. Within our range of products there are also some special systems. The special systems which we manufacture are: Static in line mixing stations, Water-Oil Manifolds, Hydrogen Generator, Oxygen Generators. KOHO compressor system are highlighted by variable, long-life design. Even after many years of use, when production system must be reorganized to cope with changing technical needs , it is essential especially from the economics point of view, that compressor system are adapted to changed condition to not only maintain but increase overall production and efficiency. KOHO compressor systems have been meeting these needs, under harsh, continuous operation, for almost 50 years. The major area of application are the Chemical, Petrochemical and Pharmaceutical industries, Reactor technology, Gas decanting and distribution, Gas recovery and liquefaction, the production of inert gas, gas storage systems, in the food industry, breweries, refineries coffee rosters, ship building, packing industry, power stations, plastics, electro and beverages industry, automatic control engineering, industrial furnaces, coking plants, extraction technology and other processing technology applications. Separation of the forced oil lubricated drive system from the dry running cylinder by oil wipers and long single or long two-compartment distance piece. Motion work : Forced oil lubricated, consisting of crankshaft connecting rod, crosshead and exchangeable crosshead guide. WE AT BOGE COMPRESSOREN plan, develop, manufacture, distribute and service compressed air supply system for customers in the field of plant construction industry and workshops. A base mounted piston compressor unit can provide an individual solution to your compressed air requirements. You can quickly and easily extend an existing compressor system into a multiple compressor system. Also available as a super silenced model (optional). The modular assembly system allows the selection of individual compressor and receiver sizes depending on the application. Also available as a super-silenced model (optional). 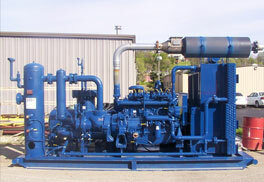 A duplex compressor package works economically when compressed air demand fluctuates greatly. The compressor can be switched as base-load or peak -load machines or as load and standby- compressor with 100% reserve capacity. Also available as super-silenced model (optional). 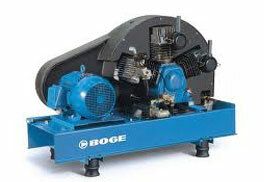 The BOGE Booster Compressor takes in precompressed and pre-treated compressed air from an existing network or from a low-pressure compressor and compresses it to the required final pressure.